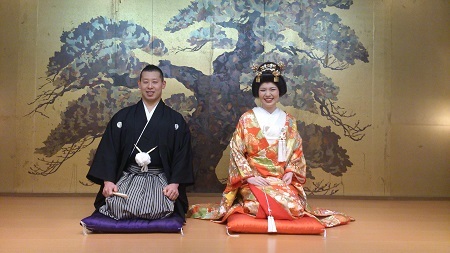 The shiromuku (white kimono) and the irouchikake (kimono with colors) were designed by a famous kimono designer in Kyoto. They were beautiful; with soft touch and bright colors. 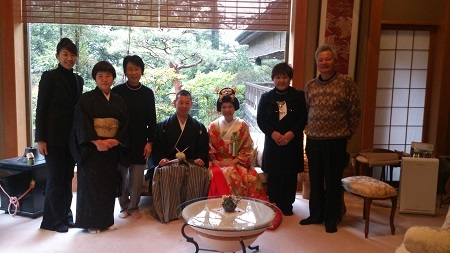 We took a photo of both families together with Okami (=madam) of Saami. Today, we did the photo shooting of Hisashi-sama and Kana-sama at ryoutei Saami. They are going to get married in February. 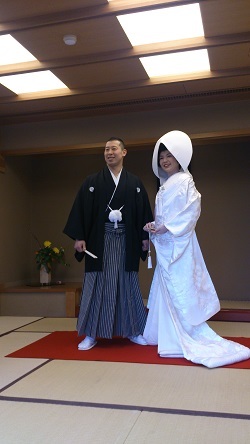 They had their photos taken in Kimono today, as they will not wear them on the day of the wedding. Both of them were very tall and looked like models! Today’s photo shooting was taken place following a wish of the bride’s mother. The parents’ eyes were dimmed with tears while they were watching their son and daughter posing for the photo in kimono. We were also moved by such a scene. We are thankful for the wonderful time and very good “goen (=opportunity to meet)” today. I hope they will enjoy the day of their wedding as well. I wish them and their families happiness for many years to come.